Awaken the Blazing Goddess in this new hit game and watch her add fiery extra wilds and free games to your game! With the Pokies.com casino lobby bursting with games, it can sometimes be difficult to choose wich new games to try. Lightning Box, one of more than a dozen game providers whose games you play at Pokies.com, has come up with a new game you should not miss: Blazing Goddess. 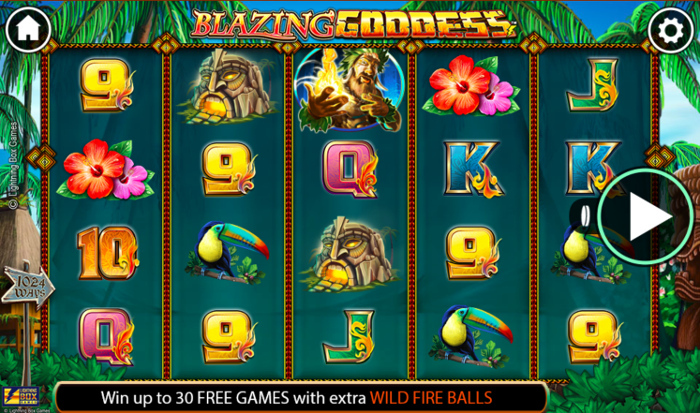 Blazing Goddess is a five reel slot machine with 1024 ways to win. If you get lucky in the game, the titular volcano goddess will throw you extra blazing wild fireballs, which can see you win big, real big. The fireballs make it easier to win (they are the game’s wild symbol) AND they double your winnings. AND if that wasn’t enough, extra fireballs are added to the game when you win free spins. You can win up to 30 free with one lucky spin of Blazing Goddess. If you like Blazing Goddess, you can play up-and-coming Lightning Box Games’ other slot machines too at Pokies.com. Just check out Astro Cat, More Monkeys (great name!) and Pixie Gold for more Lightning Box mayhem. You can play on your mobile or you computer, as all these and hundreds of other Pokies.com games work equally well on your tablet, phone and computer. If you are new to Pokies.com, sign up now and you’ll get a free $/€/£5 (no deposit required). You can play all the above Lightning Box slots, or anythinge else you like, with your free fiver.